I’m just cool like that. Today, during my daily cobweb cleaning I had a thought about my writing. 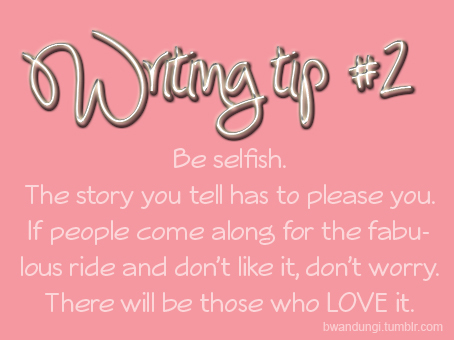 Mostly, I write because I want to be able to tell a story that I would love to read. My only audience is me and as long as I keep that in mind, the process is enjoyable and easy going. The moment I think about someone else and how they would react to the story and the kind of thing they would like to read, something blocks my creativity and I fall headlong into writer’s block. Am I a little selfish? Of course I am. It is impossible to please everyone, so I’m content pleasing myself and others who are pleased by the same things. Most Fridays I skype with my niece who will run off to her room to get a book so we can all read it together. In times like those I wonder if I’m doing right by her. She is still very young (just turned 3) and will be too involved in growing up and battling hormones for many years before she settles into the person she is going to become. When she finally does, what kind of impact will my stories have on her life? It is a question I grapple with regularly. Anywhoosies. Back to regularly scheduled activities!